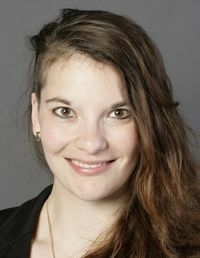 Christina Maria Franck, M. Sc. My main research interest lies in investigating cellular growth dynamics in plant cells. I mostly work on Arabidopsis thaliana pollen tubes as models, as they are single cells and elongate uni-directionally. Growing plant cells require continuous monitoring of their cell wall integrity and coordination of the latter with their internal growth machinery. In pollen tubes, the cell wall integrity pathway is governed by two redundant receptor-like kinases of the CrRLK1L- subfamily, named ANXUR1/2. In my project, I focus on two putative downstream members of the ANXUR-dependent pathway, the protein phosphatases ATUNIS1/2, and investigate their function in pollen tube growth. ANXUR receptor-like kinases coordinate cell wall integrity with growth at the pollen tube tip via NADPH oxidases. Boisson-Dernier A, Lituiev DS, Nestorova A, Franck CM, Thirugnanarajah S, Grossniklaus U.
Receptor-like cytoplasmic kinase MARIS functions downstream of CrRLK1L-dependent signaling during tip growth. Boisson-Dernier A, Franck CM, Lituiev DS, Grossniklaus U.